WASHINGTON (CNS) – The Archdiocese of Washington has voluntarily released the names of abusive priests and stated that there have been no credible claims of abuse made against archdiocesan priests in almost 20 years. On Oct. 15, church officials posted on the archdiocesan website, https://bit.ly/ 2OqpWqF, the names of 28 former clergy of the archdiocese who were credibly accused of sexual abuse of minors from 1948 onward. The list also includes the names of three religious order priests who served temporary roles in archdiocesan parishes or schools. The list was assembled as part of a comprehensive review of the archdiocese’s archives ordered in 2017 by the Cardinal Donald W. Wuerl as Washington’s archbishop. “This list is a painful reminder of the grave sins committed by clergy, the pain inflicted on innocent young people, and the harm done to the church’s faithful, for which we continue to seek forgiveness,” Cardinal Wuerl said in a statement. The Archdiocese of Washington said that in 1986, it was one of the first dioceses in the country to adopt a written child protection policy. Since 1993, the archdiocese has had a Case Review Board, and since 2002, the archdiocese has also had a Child Protection Advisory Board consisting primarily of lay experts. Since 2002, the archdiocese has had a fully staffed Office of Child Protection and Safe Environment. It said it spends about $350,000 annually on child protection efforts; training and mandatory background checks for all priests, employees and volunteers who have substantial contact with children; and safe environment training for all children in Catholic schools and religious education programs. The archdiocese also releases an annual, independently audited report on its child protection efforts, which is posted on its website and published in the Catholic Standard, the archdiocesan newspaper. “Of course, in matters such as this, our first response is to the survivors, to help them and accompany them toward healing,” Kim Viti Fiorentino, chancellor and general counsel for the archdiocese, said in a statement. She noted that the comprehensive review remains an ongoing effort. “But it is also important that the public understand that the Archdiocese of Washington has long been a leader in protecting the most vulnerable in our midst, and that there is no safer place for a young person than in an Archdiocese of Washington parish or school,” she added. The archdiocese also urged anyone aware of suspected sexual misconduct by any clergy, employee, or volunteer of the archdiocese to report it to the authorities or contact the archdiocesan Office of Child Protection and Safe Environment at 301-853-5302. 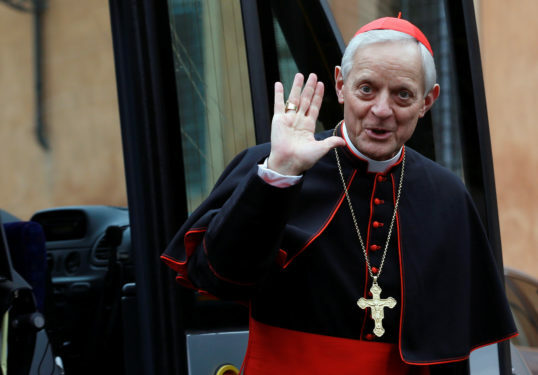 Cardinal Wuerl is currently apostolic administrator of the Washington Archdiocese and will fill that role until a successor is named to head the archdiocese. Pope Francis named him to the post Oct. 12 after he accepted the 77-year-old prelate’s resignation. As required by canon law, bishops turn in their resignation to the pope when they turn 75; the cardinal’s resignation had not been accepted until now. “The Holy Father’s decision to provide new leadership to the archdiocese can allow all of the faithful, clergy, religious and lay, to focus on healing and the future. It permits this local church to move forward,” said Cardinal Wuerl in a statement Oct. 12. In recent weeks, Cardinal Wuerl had faced criticism, including protests and calls for his resignation, after the mid-August release of a Pennsylvania grand jury report describing allegations of sexual abuse by priests and other church workers over a 70-year period beginning in 1947. The report covered six dioceses in that state, including Pittsburgh, which was led by then-Bishop Wuerl from 1988 until he was named to Washington. After the report was issued, Cardinal Wuerl inaugurated a six-week “Season of Healing” in the archdiocese to pray for and support abuse victims. He told the faithful that as his time as archbishop ends, “I want you to know of my love for all of you. I love our priests and religious who serve so joyfully and generously, I love you, the lay faithful, who manifest the kingdom in our parishes and in so many diverse and fruitful ministries.